The World’s oceans play an important role in the lives of each and every one of us. Also, the ocean is vital to the food chain. Even if you do not live close to one, you should not forget that oil and consumer goods are transported on ships, keeping the wheels of commerce turning and thus adding massively to problem of ocean pollution. Despite all this, we treat our oceans worse than the insides of our car, drowning them in plastic more and more. Every year, 8 to 12 million tons of plastic end up in them. The scale of the problem is enormous. But this is not a lost cause! We can all help to create a future with cleaner oceans. 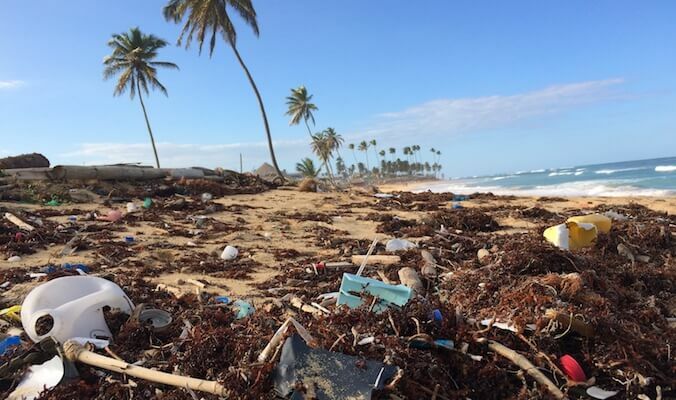 In a seldom-traveled area known as the North Pacific Subtropical Gyre, a convergence of currents has created what has since been called the Great Pacific Garbage Patch, a large accumulation of garbage drifting in the ocean. The Patch is comprised of two distinct patches, one closer to Japan, and the other between Hawaii and California. The eastern patch alone covers a surface area about the size of Texas. All kinds of ocean pollution is bad, but plastics are especially toxic to the environment. The plastic breaks down into small pieces due to sun exposure; a process called photodegradation. While plastics deteriorate, they release hazardous chemicals into the water. In addition to this, the material also adsorbs toxic chemicals like pesticides and PCBs, a bonus level of toxicity for anything unlucky enough to eat it. It was estimated that it would take 67 ships an entire year to scoop up less than 1% of the garbage in the North Pacific. These chemicals can make their way into the bloodstream and flesh of hungry animals. If another animal later eats that animal, the problem is passed along. Because humans are at the top of the chain, we aren’t immune to this issue. In fact, it all funnels toward us. Despite the enormous scale of the problem, there are those trying to do something about it. Cleaning up the plastic in the oceans, and thus minimizing ocean pollution, is a noble pursuit, and of immense value to the environment. But, it doesn’t stop more plastic from ending up in our oceans. And it will. Hence, something needs to be done to stop the plastic from getting there in the first place! Together, we can be the current of change that turns this whole issue into a distant, shameful memory. Our friends at itsafishthing.com compiled a comprehensive to guide to everything you need to know about plastics in our ocean. Read the entire piece here.